You may already have the top-of-the-line in alarm systems and monitoring services to protect your business, property and personnel. Although these security measures are vital to any robust security program, they are often not enough. With the sheer number of unique risks that we face today, business owners need to consider all of their security options. Armed security guards are one of the most effective means of securing your valuable assets and protecting what is most important to you. Off Duty Officers has been providing the country’s best armed security guards across a wide range of industries for over 25 years. Our armed guards represent the cream of the crop when it comes to private security for events, executives and VIPs, residential communities, private parties and workplaces. We work with off-duty and retired law enforcement and military personnel who have extensive tactical experience, and a skill set that can only be acquired through that exceptional experience. Paired with the intensive, personal security training that guards receive through Off Duty Officers, our clients can feel confident that they are getting the best in personal security protection available. Whether you require short-term assistance for a one-time event, multi-month security detail for a construction project or a long-term security relationship for your property, Off Duty Officers will partner with you to exceed your security goals. Our armed guards are known nationwide to be professional, highly competent and effective. The use of force is never a desired outcome. However, in the event that force is needed, you want to know that your armed security guards are trained and prepared to act. 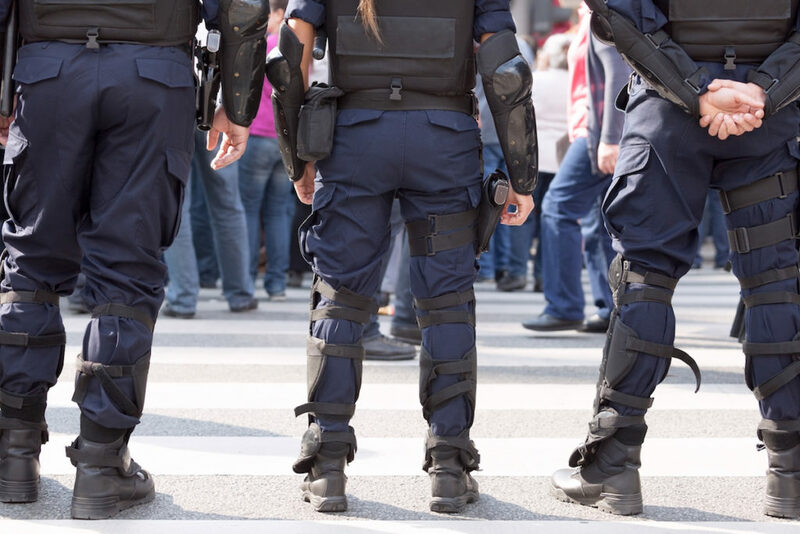 While there are many critical benefits to having an armed security presence for your business, the primary roles for an armed guard are to deter potential threats and to actively respond to immediate threats. Our armed guards know how to handle a variety of situations with the protection of your people and your property as their number one priority. In general, the presence of a security guard who is in possession of a weapon will deter possible aggressors from making dangerous threats or engaging in criminal behavior on your property. Armed guards also set the tone for others that safety and security is taken seriously on the premises. Alarm and monitoring systems can’t do that. Armed guards provide a level of safety that is second to none. In the event that the aggressor decides to move forward with his criminal plans, an armed security guard can take immediate action in responding to the threat. Our guards will know exactly how to deal with the threat, using their specialized training and knowledge to act quickly and appropriately. Not only are Off Duty Officers’ guards highly trained in the use of weapons and firearms, but they also receive training in conflict resolution and other de-escalation tactics to allow for the possibility of a peaceful resolution. The protection of your business and people is important. No amount of security is too much, especially in the unfortunate event of a tragedy or high-level security threat. Don’t leave your security in the hands of an inexperienced company. Or worse, don’t neglect to put a comprehensive security program in place. Off Duty Officers is one of the premier private security companies in the United States. With satisfied clients that include Fortune 500 companies across all industries, we provide the best when it comes to armed and unarmed security personnel. The training that we require our guards to complete is some of the most comprehensive in the industry. Our standards are high because we know that yours are too. When you want peace of mind, armed security guards are your security solution. Are you ready to provide your business with the best protection available? Contact Off Duty Officers to receive your quote today. Our team of specialists will be on the line to discuss your most pressing security needs and concerns. We will help you understand potential security risks and suggest solutions that will fit into your current security program and budget. If you are ready to get started on the road to advanced private security for your business, do not wait. Call Off Duty Officers today.